OTTAWA – Home sales via its Multiple Listing Service declined in October, both on a seasonally adjusted basis from September and on an actual year-over-year basis over October 2017, according to figures released by the Canadian Real Estate Association (CREA). The number of new listings and the national average sales price also declined. The realtors group said MLS sales edged back 1.6% in October over September, noting that while sales are still stronger when compared to the first half of the year, they remain below the monthly levels recorded from early 2014 to 2017. 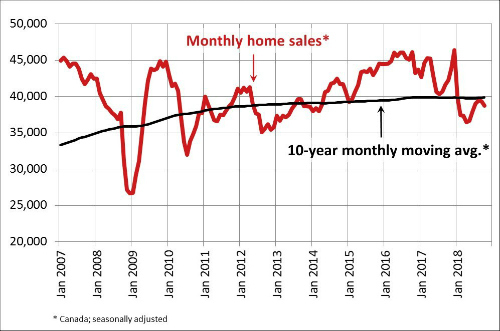 Actual (not seasonally adjusted) sales were down 3.7% compared to October 2017. Sales were down year-over-year in slightly more than half of all local markets as lower sales in Greater Vancouver and the Fraser Valley more than offset the rise in sales in the Greater Toronto Area (GTA) and Montreal by a wide margin. The number of newly listed homes sank 1.1% between September and October, led by the GTA, Calgary and Victoria, although they were more than offset an increase in new supply in Edmonton and Greater Vancouver. The actual national average price for homes sold in October 2018 was just under $496,800, down 1.5% from the same month last year. Excluding Greater Vancouver and the GTA – this country’s most active and expensive markets – from the calculation trims the national average to just under $383,000. In his research note, Rishi Sondhi of TD Economics, said the rising cost of borrowing is now acting as a brake on what was a hot home resale market.